Disclosure: I am bringing this post to you through my partnership with TOMS, the TOMS U.S. Giving program and sharing the news about their #OneForOne movement. Could you live without shoes? Take a moment and let that question sink in. Imagine going to work, the mall, the grocery store, the park, your backyard, everywhere, without shoes. As much as I enjoy staying barefoot at home, I just cannot imagine going outside the house without shoes where there are all sorts of harmful and unsanitary things I could be stepping on. As hard as it may be to see yourself without shoes, how would you feel about your children being shoe-less? Not going to happen, right? Can you imagine how heartbreaking and a blow to the self-esteem it must be to be a child with no shoes or shoes that are falling apart? As it starts getting later in the year, we all start thinking more about charity and how we can give back to our communities. School supplies in August and September, enabling those less fortunate to enjoy Halloween, making sure there’s food on the table to celebrate Thanksgiving and presents and warm clothing for the holidays. However, shoes are something I think a lot of us tend to forget about. While I always try to pay it forward and give back as much as I possibly can, it really warms my heart when corporations and businesses help us make our own communities better places with happier members. One of these awesome companies is TOMS shoes. TOMS has been giving kids around the world the gift of shoes and even sight for years, but through the end of 2014 they’re really going to outdo themselves. TOMS will be giving not just 100,000 – not even just 500,000 – but at least 1 million pairs of shoes to kids right here in the USA. How awesome-sauce is that?! How can you help TOMS achieve their goal? Just take part in their One for One mission: whenever you buy a pair of TOMS shoes, TOMS works with their Giving Partners to also donate a pair of shoes to a child in need. Finances are still tight for many of us, but most of us are still able to buy shoes for our families and ourselves. Here’s your chance to make a difference and help give back to kids in need of new shoes when you buy your next pair! 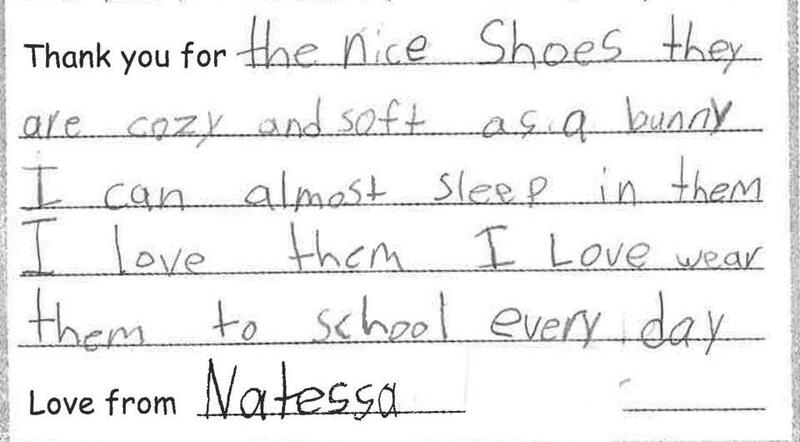 I know that the next several pairs of shoes I buy will be from TOMS so that more children can write letters just like this. What about you?